mostly audio-related ephemera. and some other Stuff. When loudspeakers are placed close to walls, the delay between the direct and reflected sound waves affects not only the perceived timbre (due to room gain and comb filtering) but also the degree to which believable phantom stereo images are created. If reflected sound waves arrive too soon after the direct sound, they generate spurious directional cues that spoil the stereo-imaging magician’s trick. Some people go to great lengths to absorb room reflections with acoustic absorbers and diffusers, but the evidence  suggests this probably isn’t a good idea. These products have inherently uneven frequency response; their presence can drastically alter the timbre of the reflected sound, and it’s harder for the ear/brain to ignore reflections if their spectral content is different from the direct sound. The precedence effect can be an effective remedy for the effect of room reflections on stereo imaging. To the extent that the reflected sound is a sufficiently delayed copy of the direct sound, with similar spectral and temporal content, the ear/brain system will take its directional cues only from the direct sound. The reflected sound gets filtered out psycho-acoustically. To make this work we need loudspeakers with frequency-independent polar response (i.e. “constant directivity”) and we need to place them far enough from reflecting surfaces. Ideally we need to delay the arrival of lateral reflections at the listening position by (at least) about 6ms relative to the direct sound. So the path length for the direct and reflected sounds must differ by at least 2m (7ft). This is hard to achieve in even a largish room, as shown in the images below. Linkwitz’s rule-of-thumb placement is >4 ft from the wall behind the loudspeakers and >2 ft from side walls, with speaker separation >8 ft. It turns out this isn’t quite enough. 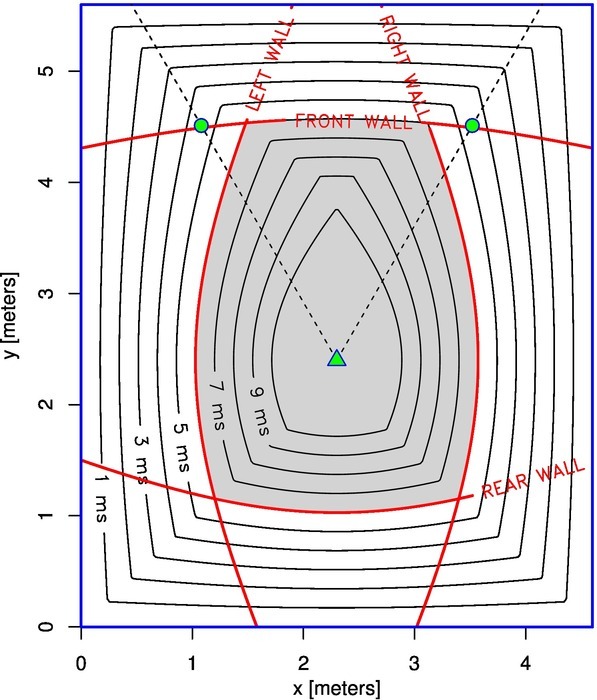 For any rectangular room with a symmetric 8ft equilateral arrangement of listener and loudspeakers, the speakers need to be at least 1.4m (4.5ft) from the side walls and 1.1m (3.6ft) from the front wall, if the first reflections from these walls are to be delayed by 6ms. The listener also has to be at least 1.1m (3.6ft) from the back wall to delay reflections from that wall. The derivation of these figures is an exercise high school geometry, the gory details of which I’ve put in this little paper. The green triangle is the listening position. Black contours indicate, for any given speaker placement, the resulting delay in arrival of the first lateral reflection at the indicated listening position. To achieve ≥6ms delay the speakers must be in the shaded region. Red contours indicate speaker placements that give exactly 6ms delay for reflection from a particular wall. The dashed lines are a guide: a pair of speakers placed symmetrically on these lines will form an equilateral triangle with the listening position. The green circles are where the speakers would be in the case of an 8ft equilateral arrangement. As you can see, this placement delays the first reflection (which comes from the side wall) by only about 4.5ms, although the front wall reflection gets 6ms delay. My Plutos and LX521 still sound impressive when placed this way, but I’m guessing from this that they could sound better. In the room above (which is about 15’×19′) with equilateral positioning, the furthest I can separate the speakers, without decreasing the arrival time delay below 6ms, is 1.9m (6.5ft). This requires that the speakers be placed 1.3m (4.4ft) from the side walls — quite a bit more than Linkwitz’s rule of thumb. Clearly, even in this largish room speaker placement is a compromise. I need to sit at least 1.1m from the back wall, partly to delay reflections from that wall, but also to keep the bass from booming. Here I’m only getting 2ms delay for the front wall reflection. 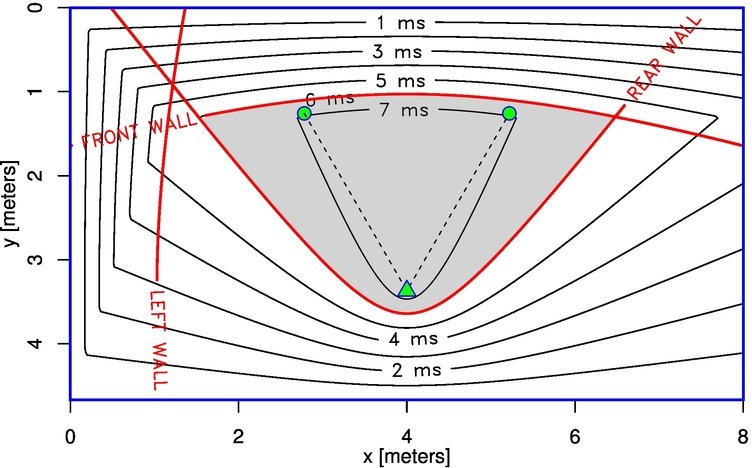 To get 6ms reflection delay for this wall the speakers need to be at least 1.1m (3.7ft) from the wall, which allows for an equilateral separation of only 1.6m (5.4ft). This shows that the side wall reflections are delayed by only 2ms or so. In this orientation it’s almost impossible to delay the side wall reflections enough. To achieve 6ms delay with equilateral placement, the greatest speaker separation I can use here is 1.1m (3.6ft). This is very much near-field and a bit claustrophobic. I’ve listened to my Plutos this way, but dipole speakers are out of the question. The previous orientation definitely has better imaging. This arrangement gives almost 7ms delay to the front wall reflection, a bit more for the rear wall, and about 15ms for the left wall. The listener is 1.3m from the rear wall. The “right wall” is actually open, so this arrangement sacrifices symmetry, but with the left wall so far away I doubt that this matters as much as the gains in reflection delay. Q: What is the smallest room where one can separate the speakers by 8ft (equilaterally) and still delay lateral first reflections by 6ms? A: About 5.2m (17ft) wide by 4.3m (14ft) deep. You can read the details in this paper. Moving any of the room boundaries closer to the listener will put one of the reflections at less than 6ms delay. In this configuration all four first reflections arrive at the same time — perhaps not a good idea — but in a slightly larger room it would be possible to place things to stagger the reflection arrivals. Floyd Toole, “Sound Reproduction: The Acoustics and Psychoacoustics of Loudspeakers and Rooms”, Focal Press, 2008. This entry was posted in Modeling & Simulation by Richard Taylor. Bookmark the permalink. Interesting analysis… I was wondering how you generated those graphs, and am thinking about creating similar working zone kinds of graphs for my rooms, would be nice to have a calculator/visualizer for such. I use asymptote (asymptote.sourceforge.net) for my graphs. If you’re interested I could post the scripts I used here. I am also interested in graphs. Please post the scripts! Done. I put the code in a new post. I have installed the Asymptote. Hi Richard, congratulations for your work. In your Listening Room #2 (6.70×3.65m) you have to try to put listener point close to the back wall (the largest). You will say time delay and reflection level from back wall is unacceptable, instead time delay is too short to be perceived, and also reflections no have angle with Listener to deflect the phantom images of sound stage. About to keep the bass from booming, now the loudspeakers are very far from walls so bass frequencies will be very clean and dry, so that a modest reinforcement is welcome. Put yours sofa on back wall! My suggest is not only a theoretical disquisition but I heard my Loudspeakers in a similar disposition. I made a pair of really omnidirectional (horizontally) Loudspeakers (like Duevel, certainly better than the model Enterprise, but probably worse than Venus), and they played in a quite irregular room 5.75×5.05m with sofa on wall length 5.75m. Several tests to find the balance between the channels led to an asymmetrical arrangement, but this was one of best performance that I have achieved. I think this scheme should be included in the range of possibility for a high quality listening, because it lets you use the room across the width, and widen the sound stage. 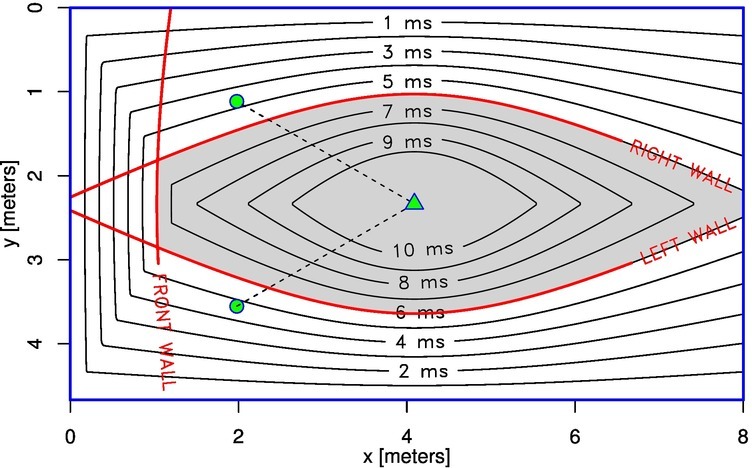 1) You wrote: “Distance to Wall Behind Listener 0.35m – delay 1.8msec; Reflection Level rel Direct dB -5.1dB.” But sound pressure drops 6dB per doubling of distance. Here the direct sound travels 2.2m while the reflected wave travels 2.9m (2×0.35m=0.7m more than direct sound): that puts this reflection down by only 20*log10(2.9/2.2)=2.4dB. 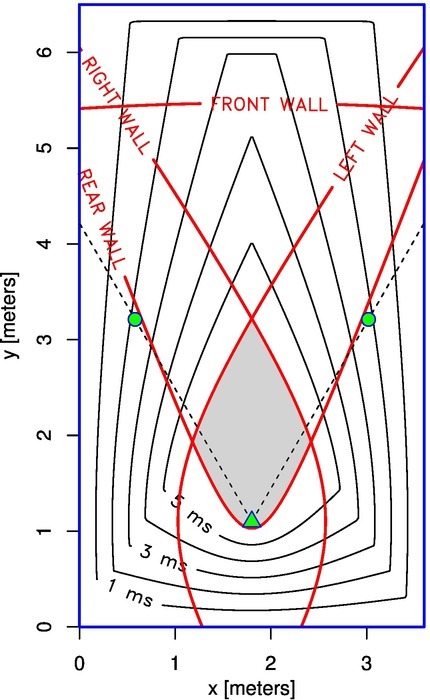 3) You wrote: “About to keep the bass from booming, now the loudspeakers are very far from walls so bass frequencies will be very clean and dry… Put your sofa on back wall.” Actually putting the listener near a room boundary causes *exactly* the same response aberrations (comb filtering, boomy bass) as putting a source near a boundary. This is the Principle of Reciprocity (which comes from that fact that the point-source Green’s function is unchanged if source and receiver locations are swapped). If the theory doesn’t convince you just try making magnitude response measurements 30cm from a wall. Certainly you’re right that not all reflection directions have the same effect on imaging. But it isn’t clear what relative weights to give to each reflection, and how those weights should depend on level. For simplicity I’ve just set the goal as making *all* wall reflections delayed more than 6ms. You are undoubtedly more competent than me, but my topics are based on a listening of a setting made by me, like already described, some time ago. Only later I have tried to rationalize causes and effects. Before to answer to points 1) 2) and 3) I want declare what is most important in my listening philosophy, but keep in your mind that I am experimenting with a really omni-directional (horizontally) loudspeakers, maybe similar to cardioid Pluto but very different from your dipole system LX521. For e.g. : I prefer a bass gamma with small defects rather than a very damped bass but too slight if not inaudible. However I can not stand a bass overflowing or poorly damped. Idem, I consider a very grave defect the lack of three-dimensionality and the narrow listening window offered from traditional loudspeakers, instead tolerable the difficult localization of the non impulsive smaller sounds that a pure omni-directional system plays like suspended in the air. Again, the omni-directional sound is a experience that few know, but those who test it are very amazed from extreme naturalness of sound and spaciousness of the scene. However the first lateral reflection should have at least 6 ms of delay from direct sound, then the sources will be very close and the listening point also, unless the room is very wide (ideal condition). The loudspeakers are acoustically invisibles also from a very small distance, but having them so close together is not natural visually. My target is get away from the speakers and enlarge the scene; following my suggestion would be so. Obviously all decisions are the result of a compromised. I can prove, I am experimenting in this way, that all direct lateral reflections are harmful. The same for indirect lateral reflection coming from front wall that carries the left channel to right ear, and vice versa. They should be as much as possible attenuated. If you want to do an interesting test (with Pluto), take two thin propylene panels 1000x500x3 mm or similar, apply them on lateral walls in correspondence of first reflections at ears height sitting with 10-15° tilted upward (you consider a total of 2+2 reflections). With an omni-directional radiation the first lateral reflection has similar delay of the first frontal reflection, and same attenuation (for instance: both are generated from left channel). This may suggest a greater stereo opening, ma the first reflection of the left channel from right wall (though with greater delay and attenuation) will do the opposite. Furthermore all this tends to make the image unstable. Instead eliminating (dipole? ), attenuating (? ), deviating (this experiment) the first left lateral reflection, you will be able to hear the second front lateral reflection from left corner verso your left ear, and so on right. This reflection has delay and attenuation much greater than the first lateral reflection (consequently is ignored from our auditory system), and it has the same high quality of the first frontal reflection, sharing with it the temporal congruence. And now what feels different? Now the scene is really more wide but also more stable, and the lack of acoustic pressure from lateral walls give you the illusion that there are no, of almost being outdoors. About the indirect lateral reflection coming from front wall that carries the left channel to right ear, it can’t to be deflected with a panel. I no longer use panels to direct the sound, but I do it by applying silhouettes to the acoustic lens of my speakers. Well, the detail of the middle frequencies and the spatial placement of the minor sources are much increased. Recordings (jazz and classic music) with very complex scene now show details that I didn’t know. This was the greatest surprise. I have dwelt too. What I’m telling you is that are important delay and attenuation of the reflections compared to the direct sound, but that they are equally important in comparison of the reflected sounds to each other. And also that many reflected sounds (about 50-75%) are harmful. And then that the best system should be the dipole radiation, having theoretically emission zero on lateral axis, though the dipole systems that I happened to hear were very far from performance to which, today, I am accustomed (but much better than traditional systems). My ambition is produce an asymmetrical omni-directional loudspeakers system that has the advantage of dipole system about directional diffusion (but I can direct the sound in arbitrary way) and the simplicity of a system which dipole is not. I wonder if I have intrigued you, and if you want to try the solution of the panels. 1) I think you forgot the impact attenuation on wall. Conventionally it varies from zero to 3 dB, zero if the incidence is tangent, 3 dB if is perpendicular. About rear reflection the incidence is quasi-perpendicular, then, because your counting is right, we will have 5.1-2.4=2.7 dB which is correct. However I agree that also an attenuation of 5.1 dB it is not much; at least 6 dB is desirable. 2) No to flush-mounting the sources in the wall, because they would lose the radiation quality which interests us, or to flush-mounting the listener in the wall because it makes me a bit of anxiety. Well, nothing is without consequence, however image shifting isn’t probable in this case because the reflection angle is quasi-tangent the ears, and lacks a direction for a image shifting. About the comb filtering with a distance of 0.35m, the first dip it would be near 250 Hz, and at this frequency it could be enough narrow to not be perceived.. but here I am hazarding. 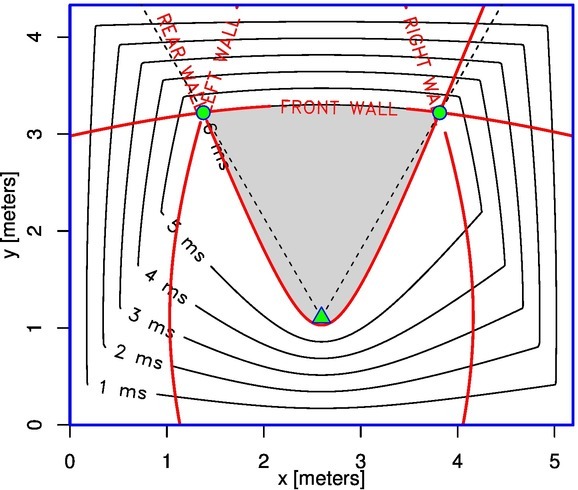 I still believe it is preferable a listening point close to rear wall rather than 1 meter away, where the first dip would be at lower frequency (but not enough, 85 Hz?) and more wide. 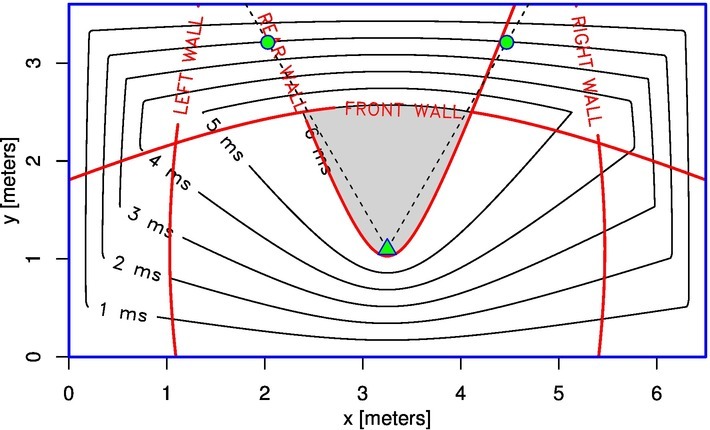 3) from 1 meter and 0.35m of distance from rear wall, it change only the frequency at which intervenes the reinforcement, rising up to range middle-low. At least with a wall length 5.75m and even better 6.70m like your, the corners are very far, and this further reinforcement is at low frequency. You have reason but I will not be able to take that measure soon, not in that room. I can take it in my living room but it is very different, approximately 7.00×4.00×2.8m used on length. I will do it. I hope my English is not too horrible and that the passage on reflections and panels is understandable. It would need a drawing. Direct sound superimposed on a strong reflection causes comb filtering (dips in the magnitude response at uniformly spaced frequencies where the direct sound and reflection are out of phase). Ordinarily the reflection is much weaker than the direct sound; destructive interference will only be partial and the dips will be shallow. But the dips will be deeper if two or more reflections arrive at the same time, since together they behave like a single strong reflection that can interfere quite strongly with the direct sound.